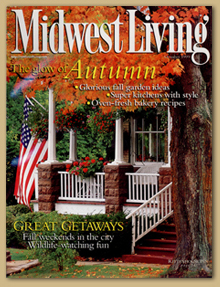 As seen in Midwest Living in June 1998. More than 160 years ago, passengers on boats floating along northeast Ohio's Sandy and Beaver Canal docked at this red brick tavern (30 miles southwest of Youngstown). The Canal long ago silted in, but you still can relax in the historic restaurant's seven period-furnished rooms. Peter and Jean Johnson, renovators of buildings with heritage, rescued the decaying three-story and a neighboring 1820s structure. After a 2-year restoration, they reopened this vintage American tavern. Overnight guests also can stay in five upstairs rooms, filled with antiques Jean collects. The old building inspires Chef Angus McIntosh, an Ohio native who finds the freshest ingredients in this rural area. Beans and tomatoes sprout in a garden across the street. Desserts might include apple crisp baked with locally grown fruit. 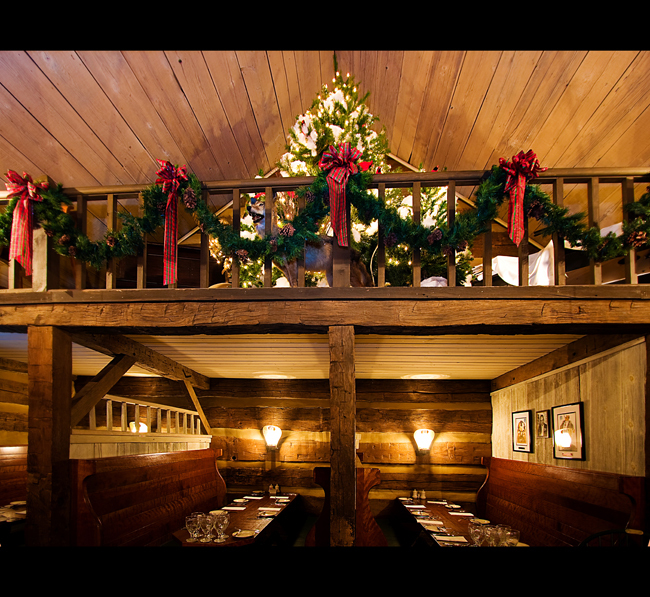 Signature meat dishes from old-fashioned smokehouse in the nearby courtyard include pheasant and rack of Ohio lamb. 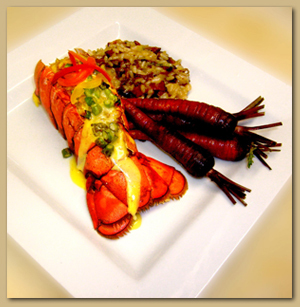 Angus honed his cooking skills in restaurants from the Deep South to the Pacific Northwest. He serves Louisiana-inspired sweet-potato-encrusted snapper with pickled okra-tomato vinaigrette. From Seattle, shrimp dumplings mingle different flavors that remind diners of authentic dim sum. 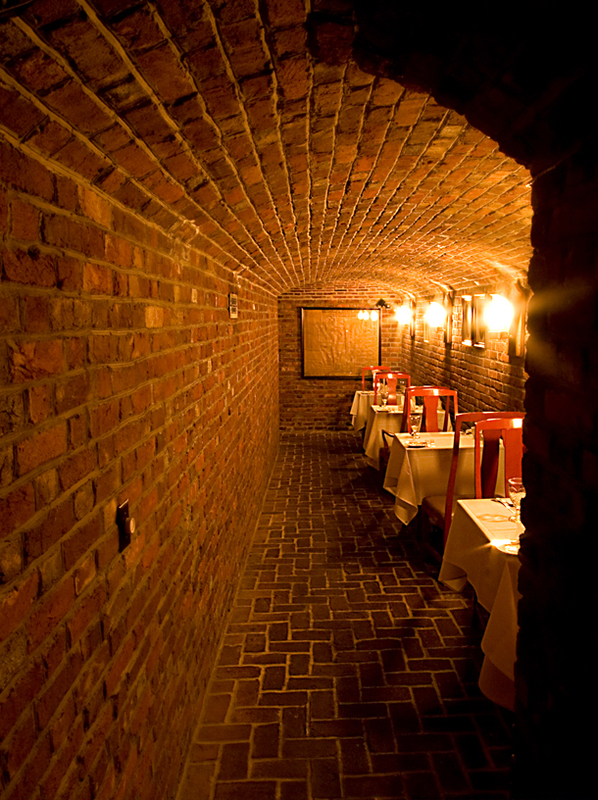 Guests often linger over coffee downstairs in Gaver's Rathskeller, a room with hand-chiseled stone-and-brick walls. 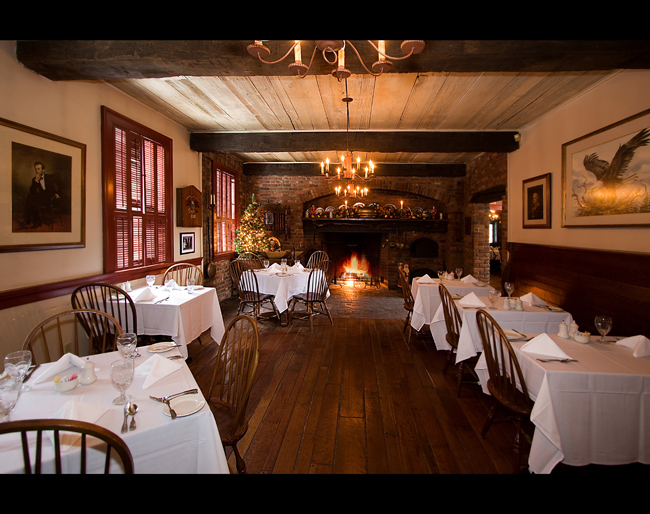 In the wood-paneled Patriots Tavern Room, Revolutionary War artifacts recall evenings long ago, when diners strolled in by torchlight from canal boats docked nearby. As seen in Ohio's Dining Guide in August 1998. Historic Plymouth Street, with its many century homes and tall trees, is an architectural wonderland. Twenty-two buildings are still standing, a century and a half after they were built in early Hanoverton, a thriving port on the Sandy & Beaver Canal. The Spread Eagle Tavern and Inn is one of them, built in 1837, and is known today as one of the finest remaining examples of Federal period architecture. The Spread Eagle Tavern is also a fine restaurant. 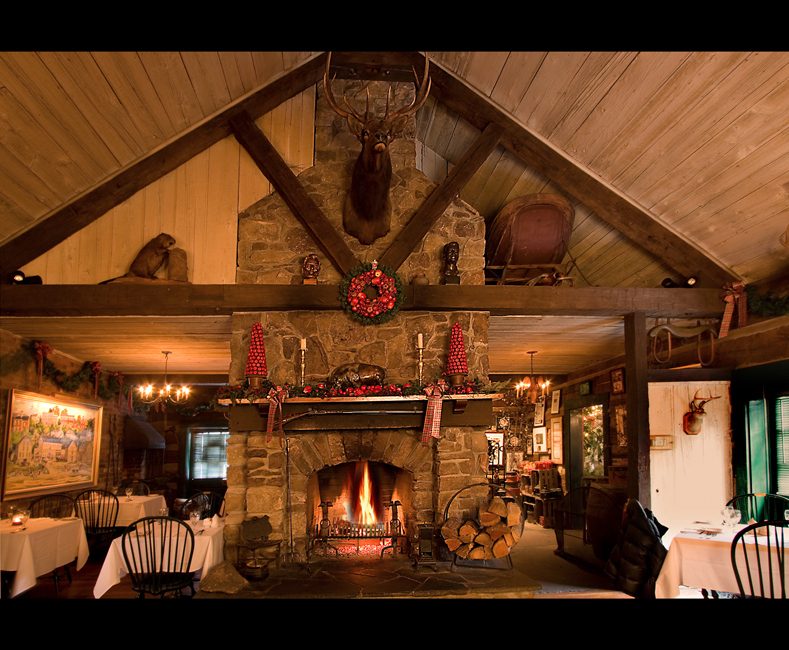 Diners can choose the rustic Barn Room anchored by a vast stone fireplace or the Patriot's Room where a 1779 Cowpens, South Carolina's Revolutionary War battle flag, has a place of honor on the wall and tiles behind the bar tell the story of the canal era. For an intimate dining experience or for private parties, five smaller dining rooms are available. There's a wide selection of beef and seafood, but the Spread Eagle prides itself on smoked meats prepared in their own smokehouse. 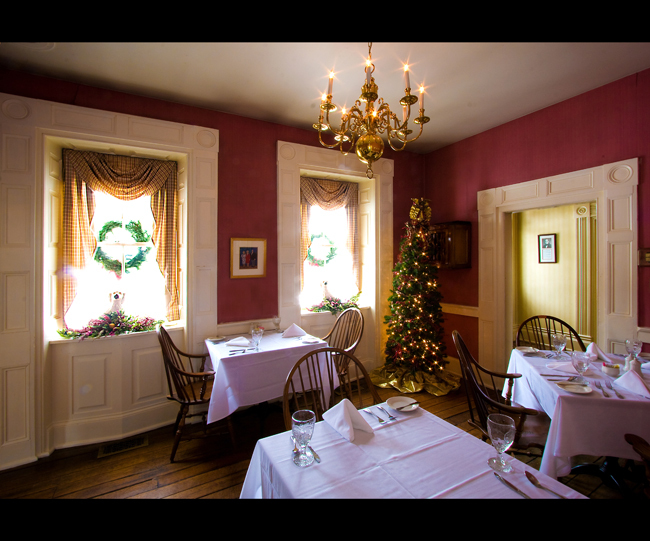 Part of the fun of coming here are the surprises as you make your way through the inn: a complete cobbler's bench in an alcove, a Spirit of '76 painting by Archibald Willard in the hall, photos and portraits of historical figures and canal-era art on the walls. 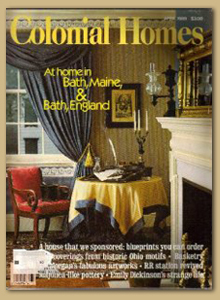 As seen in Colonial Homes March 1998. In the early 1800s, the development of the Sandy and Beaver Canal linking Pittsburgh and Cleveland brought prosperity to Hanoverton, a tiny town in northeast Ohio. The canal wound its way from the Ohio River near Pittsburgh west through Hanoverton, to the Ohio and Erie Canal, which connected to Cleveland. To serve the increased business that came with the canal's development, prominent Hanoverton resident Will Rhodes built an inn and tavern called the Spread Eagle in 1837. Architectural elements, including carved linters above the front door and windows and raised paneling throughout the interiors, are believed to have been taken from pattern books by Asher Benjamin, the prominent late 18th- and early 19th- century American architect. In 1854, the opening of the Cleveland and Pittsburgh Railroad, which bypassed the town, led to the closure of the canal. Hanoverton returned to the sleepy town it had been before the boom. The inn closed in the late 1800s and became a private home, which it remained until Peter Johnsonther., bought the structure, at auction, in 1988. Peter, president of Summitville Tiles from 1947 to 1990, had no idea what the Spread Eagle had been or would become when he purchased it. His original intent was to use the building as a guest house for visitors to the brick and tile manufacturing firm that has been owned by his family since 1918. "Sumnmitville is in a remote area," explains Peter's son, David Johnson, who took over as president when his father retired. "There was no place nearby to take guests who come here from around the country and around the world. My father's primary objective was to offer accommodations to our business associates." 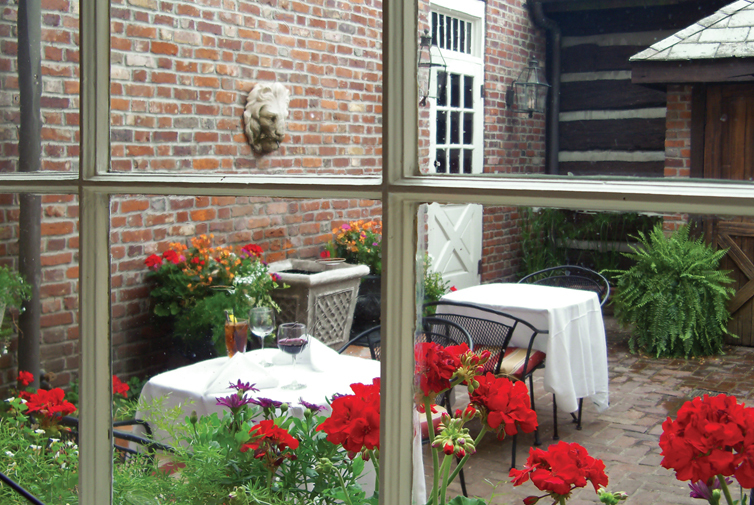 Today, the inn offers rooms and meals to the public as well. The elder Johnson investigated the history of the Spread Eagle Tavern and launched a two-year project to restore the building. Original windowpanes were retained, sagging floors were replaced with poplar planks and hand-forged square nails. "The rooms were stripped down to the stud walls so we could rewire and replaster," says David. "Every piece of woodwork was removed, numbered, restored, and then replaced." Hand-painted tiles by Summitville, many depicting local historic scenes, were added to fireplaces and bar areas. 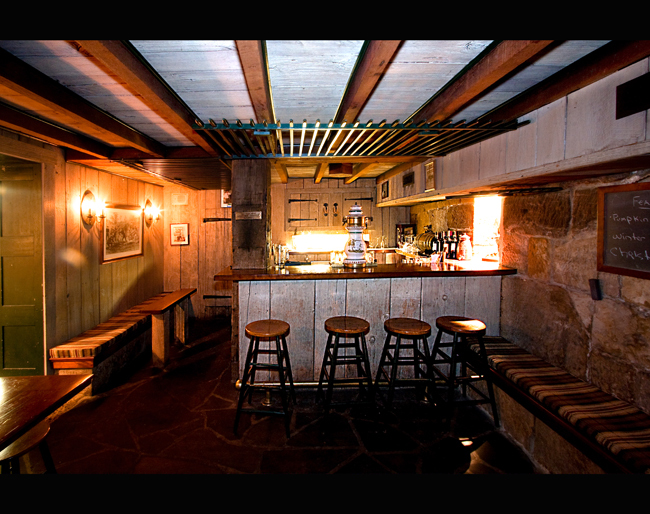 In the basement, Johnson added a rathskeller with a 12-foot vaulted ceiling made with bricks from a 190-year- old home. The room maintains a year-round temperature of 50 degrees, making it ideal for wine storage. Johnson also reconstructed a smokehouse, livery, and country kitchen with walk-in fireplace hearth that were demolished earlier in the century. "My dad salvaged weathered beams, siding, handblown window glass, and foundation stones from demolished area barns and incorporated them into the reconstruction of these outbuildings," says David. Walls between the tavern and an adjacent 1820 house were torn down, expanding the dining space. Peter's wife, Jean, with assistance from J. B. Ayers III and Paul Dolrea of Antiques & Interiors of Willoughby, Ohio, and Fort Lauderdale, Florida, created interiors to complement the architecture. Longtime collectors, Jean and Peter Johnson purchased mirrors, pewter ware, candlesticks, and other antiques and reproductions for the inn during their travels here and abroad. Old photographs, an original Revolutionary War flag, and historic documents pertaining to Hanoverton complete the interiors. Each of the public rooms and the five guest bedrooms is named for a local or national historic figure. The Asher Benjamin parlor honors the architect whose drawings inspired the inn's design. The Marcus Hanna room is named for the local industrialist who funded many presidential campaigns, including that of William McKinley. The McKinley and Taft dining rooms honor former presidents who also were Ohio natives. There also are bedrooms named for Abraham Lincoln, George and Martha Washington, Thomas Jefferson, and Dolley Madison. 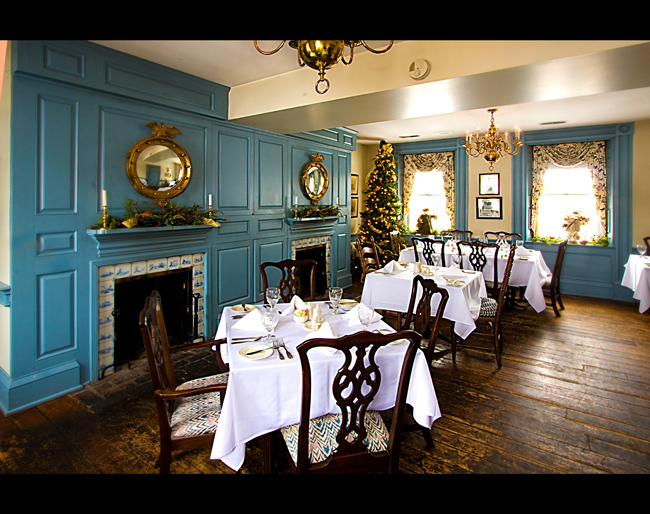 The only room named for a contemporary figure is the Barbara Bush dining room-Barbara Bush was First Lady when the Spread Eagle reopened on October 2, 1990. "My mom thought it would be nice to name a room after a living woman admired by many people," explains David. The date is also Peter Johnson's birthday. When David Johnson succeeded his father as president of Summitville, he also took on responsibility for the inn. As chairman of the Columbiana County Republican party, the younger Johnson is an active fund-raiser for the Ohio Republican committee, and has wooed prominent politicians to the inn, includ- ing Jack Kemp and Newt Gingrich. Brass nameplates on the backs of chairs note where each guest sat. David's ability to bring political glitterati to the Spread Eagle Tavern has led many other dinner and overnight guests to the establishinent, including some Democrats, we're told. We suggest calling to confirm.